Κτισμένο το 1930, το The Shalimar Boutique Hotel αποτελεί ξεχωριστό σημείο σε Μαλάνγκ, καθώς και έξυπνη επιλογή για τους ταξιδιώτες. Μόνο 2.44 KM από το κέντρο της πόλης, η στρατηγική θέση του ξενοδοχείου διασφαλίζει ότι οι επισκέπτες θα έχουν γρήγορη και εύκολη πρόσβαση σε πολλά από τα τοπικά σημεία ενδιαφέροντος. Από τη βολική της τοποθεσία, η ιδιοκτησία προσφέρει εύκολη πρόσβαση σε κορυφαίους προορισμούς της πόλης. Το The Shalimar Boutique Hotel προσφέρει επίσης πολλές εγκαταστάσεις για να εμπλουτίσετε την διαμονή σας στη Μαλάνγκ. Το ξενοδοχείο σας προσφέρει μια μεγάλη επιλογή υπηρεσιών, συμπεριλαμβανομένων των 24ωρη υπηρεσία δωματίου, 24ωρη φύλαξη, ημερήσιος καθαρισμός, δωρεάν WiFi σε όλα τα δωμάτια, υπηρεσία ταξί. Όλα τα καταλύματα διαθέτουν τις απαραίτητες ανέσεις για να εξασφαλιστεί μια ασυναγώνιστη αίσθηση απόλαυσης. ΟΙ ψυχαγωγικές δραστηριότητες του ξενοδοχείου, οι οποίες περιλαμβάνουν τις γυμναστήριο, εξωτερική πισίνα, σπα, μασάζ, είναι σχεδιασμένες για να χαλαρώνετε και να ξεφεύγετε. Όποιος κι αν είναι ο σκοπός της επίσκεψης σας στη Μαλάνγκ, το The Shalimar Boutique Hotel είναι μια εξαιρετική επιλογή για μια χαρούμενη και συναρπαστική απόδραση. Pros : Nice and Unique Interior design Free minibar, Malang traditional snack and drinks Cons : Improvement on room cleanliness, bed sheet a bit dirty and there was soap plastic in the shower room floor. Also need to make sure that the tabble (near TV) is clean. This is a lovely hotel which is good value for money. Stayed for 3D/2N in late Okt. 2017 for a working holiday with my family and our entourage. Booked 3 rooms through Agoda for 990 each, as the hotel website prices are outrageously expensive. Front desk staff was courteous and helpful in upgrading one our Premiere room to the Royal Suite (don’t expect much in the Suite btw). Rooms were classy, clean and cozy. Bathrooms quite small with shower in bathtub. Every time we showered there would be puddles of water on the floor, as the glass covering the shower bathtub only goes halfway. As other reviewers mentioned, the AC is quite loud and cold. Other reviewers also complained about the loud street noise in certain rooms closest to the Main Street, which I can vouch fo also in the Royal Suite. Excellent breakfast, very tasty (especially the tempe) probably typical of a Malang breakfast at home I would guess. Large clean swimming pool, small fitness center, great terrace for sitting and relaxing. Parking quite limited as the hotel is in a central residential area. 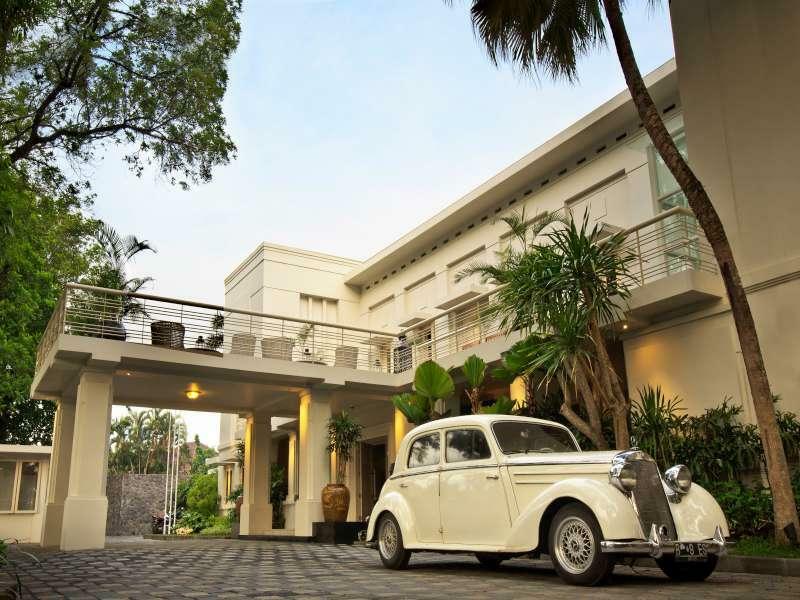 Overall on of the best boutique hotels in Malang with limited facilities. Everything about the hotel is good. It's a glamorous hotel, the staff are professional, understandably it's not cheap. The e only thing that they could do better would be to increase the food portions. The food is good but the portions are tiny by western standards. Excellent service and facilities. Long way from Surabaya though. super clean hotel with classic white design. overall it is different experience with other usual 5 stars hotel. The hotel's exterior reminds us so much of our country's Raffles Hotel. Its design is impeccable and luxurious. The hotel is very clean and well-maintained; and so is our room. Their staff is always full of smiles, very efficient and ensure that we had a comfortable stay (and we did!). We had our anniversary dinner specially arranged by the staff when we requested for it, and one of them named Maria helped recommend a pediatrician for us to visit when our toddler fell ill during our stay. Would love to return again as we feel like it is our second home. The hotel has a nice interior with slight of vintage touch on it...the staff were very polite and helpful..the cleanliness is very good, from the lobby til the room. When we asked for something like hair dryer's adaptor or towel, they had quick responses. Although the breakfast didn't have many variation but the taste were good..especially the pastry...they also have nice high tea package that I recommended to everyone. Something must be considered is the maintenance of the showers in bathroom..they have double shower but the ceiling shower in my room was broken...and we found a small house lizard in our bathroom but after we called, the staff came and removed the lizard. For the young family like us who brought small kids, they do have swimming pool. Don't expect to have many facilites for the kids. Overall it was a nice stay...we will be back for sure.. The cleanliness, the friendliness of the staff, the quality of bed, pillows, and food, are way beyond my expectations for a hotel in a small city like Malang. I now despise any other hotel in Malang just because of this hotel. The downside is the bathtub, it's so badly designed that you're gonna end up with a flood in the bathroom after shower. So I just ask for a room with a shower instead of a bath tub everytime I go back. And oh boy do I go back a lot. This hotel is nice, clean with high international standard - maybe they will be more efficient if they allow us to switch off everything when we go out, the saving can be used to make customer happier ! The pennies look after the pounds ! ! ! Very homey feeling. The room and the hotel grounds all very nicely decorated. Have a strong heritage value as well. We only came here because the Tugu hotel was fully booked for that night. Σιδηροδρομικός Σταθμός Malang στα 1.64 χλμ.